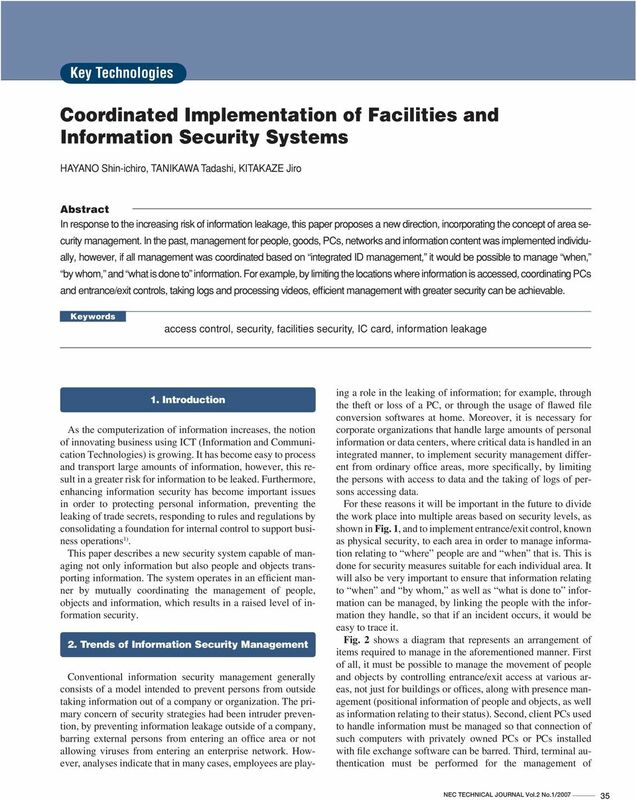 Download "Coordinated Implementation of Facilities and Information Security Systems"
3 Special Issue : Information Security in Enterprises dinated in such a manner and because the of policies is conducted by an integrated ID system, it is possible to implement changes at one location, thereby making the operation and of the overall system more efficient with fewer errors. Furthermore, since all authentications are linked, it is possible for a user to simply scan his or her IC card once to be authenticated for all systems. By utilizing the function for passing on authentication information from one system to another, it is also possible to implement security enhancements without placing any burden on the user, such as logging off a PC when the user leaves the work area. 4. 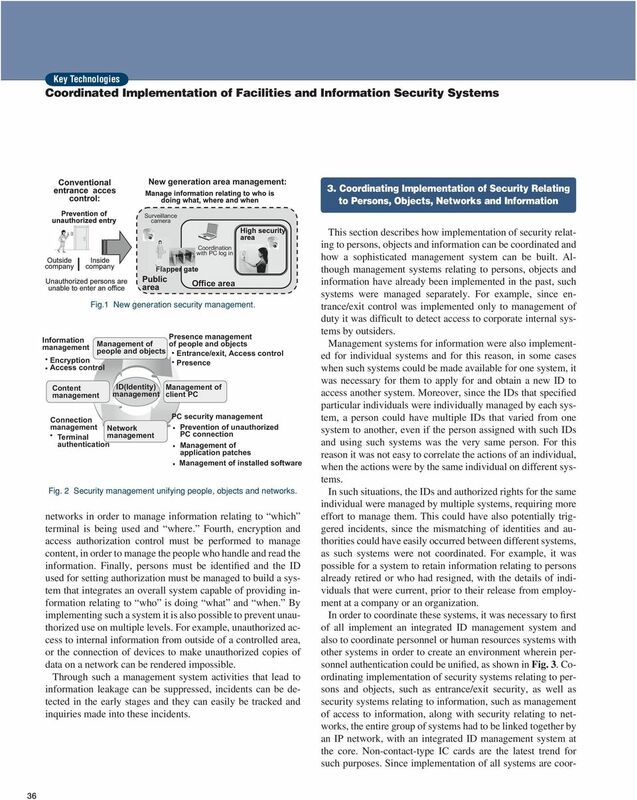 Practical Examples of Coordinated Implementation of Security for Persons, Objects and Information Fig. 3 Coordinated implementation of security relating to persons,objects and information. Fig. 4 shows a practical example of coordinated implementation for persons, objects and information. 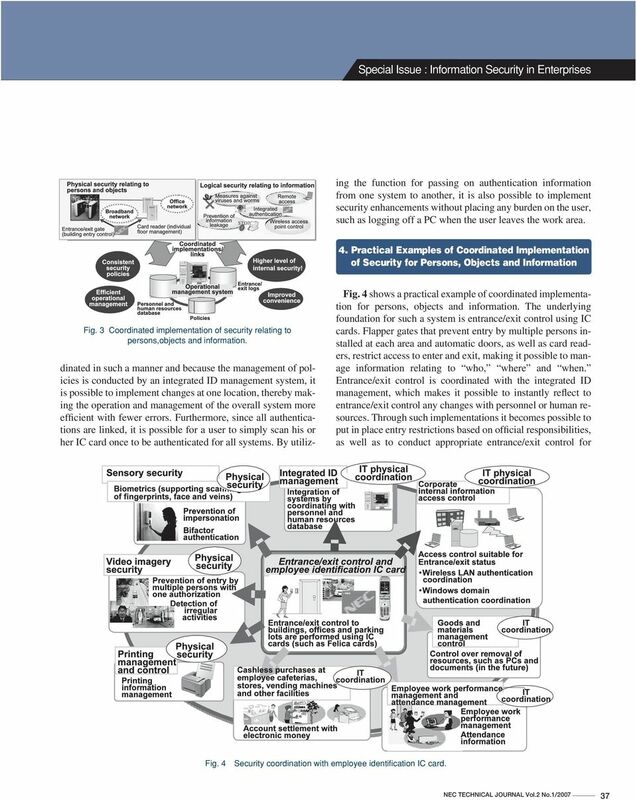 The underlying foundation for such a system is entrance/exit control using IC cards. Flapper gates that prevent entry by multiple persons installed at each area and automatic doors, as well as card readers, restrict access to enter and exit, making it possible to manage information relating to who, where and when. Entrance/exit control is coordinated with the integrated ID, which makes it possible to instantly reflect to entrance/exit control any changes with personnel or human resources. Through such implementations it becomes possible to put in place entry restrictions based on official responsibilities, as well as to conduct appropriate entrance/exit control for Fig. 4 Security coordination with employee identifi cation IC card. WHITE PAPER. 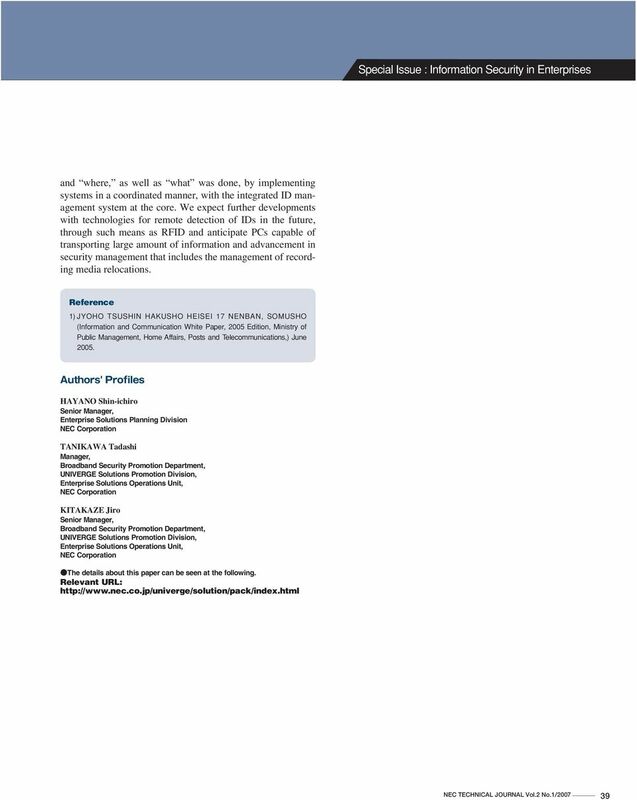 Automated IT Asset Management Maximize Organizational Value Using Numara Track-It! p: 813.227.4900 f: 813.227.4501 www.numarasoftware. 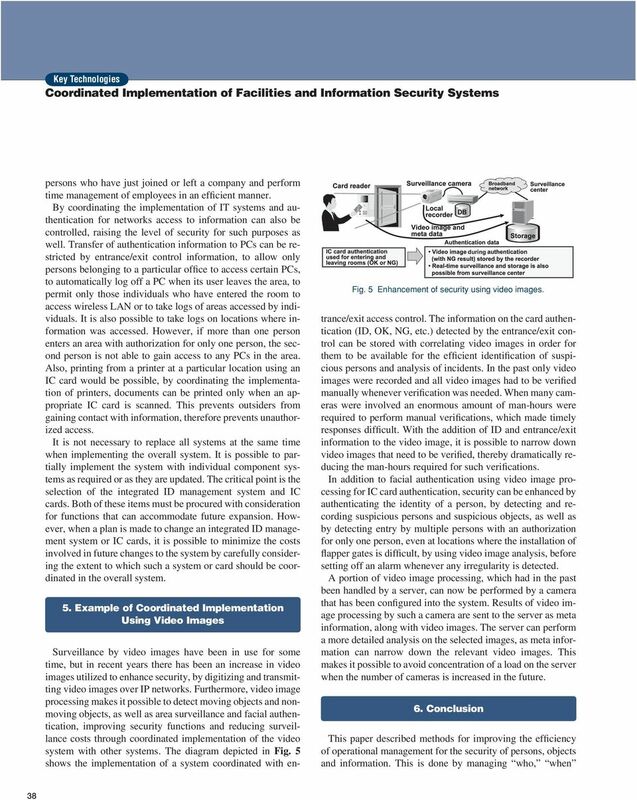 Interfacing ISONAS Access Control to an IVC-controlled Video Surveillance System To provide more flexibility and scalability for comprehensive security systems, more components are becoming IP enabled. Astaro Services AG Rheinweg 7, CH-8200 Schaffhausen Supplementary data protection agreement to the license agreement for license ID: between...... represented by... Hereinafter referred to as the "Client"
Please check www.milestonesys.com for updates to make sure you install the most recent version of our software.